There's No Place Like Home: Ikea! 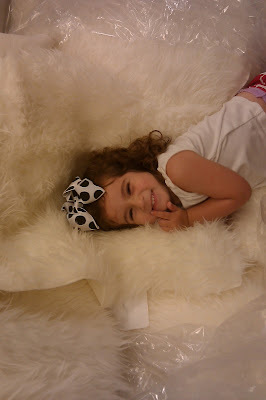 Katie and I went to Ikea with my sister and niece. 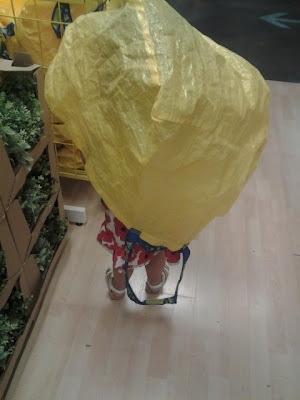 Ikea is Katie's Disney World. She laid on everything soft and played with ALL of their toys! This picture reminded me of when I was little. My mom temporarily lost me in a department store and she found me under the covers in one of those fake beds! I kind of like these bunk beds. They can separate into 2 twin beds. 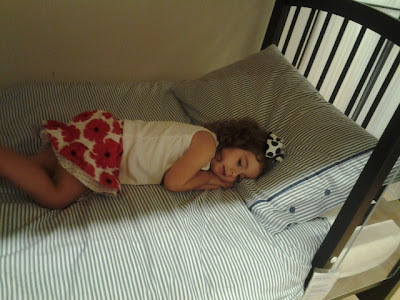 I am starting to come to grips that Katie can't be in her crib forever! Although I really do like my kid caged in at night. Plastic bags are NOT a toy, except sometimes they are. My red couch is from Ikea. You can buy a white cover for only $49! I am tempted to get one and dye it! Maybe either turquoise or hot pink or something else fun. Have any of you done that? If I ever have $50 burning a hole in my pocket, I might give it a whirl! Money doesn't last long in my pockets. It fairs about as well as m&m's. Gone before you even know what happened! $49?!?!? I better not admit how much we spent on a spare set of covers for our PB sofa. Ay ay ay! I'd love to see them dyed turquoise! Don't they make pink covers? I know there are pink covers for some of their pieces. i am deciding between the ikea and pottery barn.. haha $1000. difference. How long have you had your and how is it holding up? 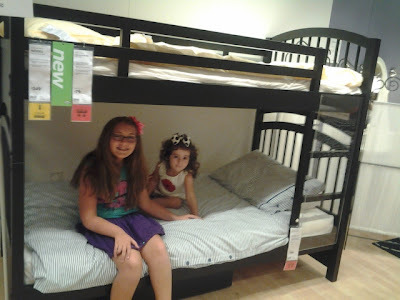 We will be in Plano this weekend and of course I must make a trip to Ikea. We have had our Ikea couch for several years. Maybe 5 or 6? It has held up really well. It is not the couch we use with the TV, so it is not used all day, everyday, but still quite a bit. For the price, I am happy with it!